Free Utility for users of 4POS Retail or 4POS SC to update their stock using a Pocket PC device with Windows Mobile 5, 6 or later. The download is a single cab installation file (1MB). Copy the download file (4util.cab) to your Pocket PC. Install by tapping the file within File Explorer (Windows button, Programs, File Explorer). To do the above using a Micro SD card, open the contents by using the drop down menu at the top of File Explorer and select the Micro SD card (SDMMC) then tap the file. The shortcut is put on the start menu (not the program menu). Copy the inventory file (film.dat) from your 4POS installation (C:\4POS or C:\4PSV by default) to the root folder of your mobile device (usually My Device, NOT the 4POS Utility program file folder). Hint: The Configuration item allows the file to be used directly from a memory card. Use to edit any inventory. Copy the inventory file back to the 4POS installation folder. 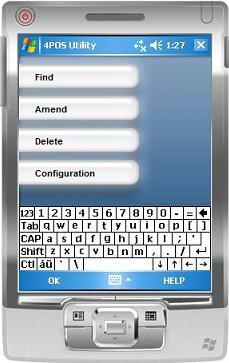 The program requires a Windows Pocket PC with Windows Mobile 5, 6 or later. It is not suitable for use with a Windows Smartphone or Pocket PC 2003. Note that Windows Pocket PCs usually have touch screens, Smartphones do not. In File Explorer move the highlight to the file with the center navigator button then click Menu, Edit then Copy. Move to the target location then click Menu, Edit then Paste. Please check you copied the inventory file to the right location. The program looks for the film.dat inventory file in the My Device root folder, if it cannot find it, it creates a placeholder file with a single entry.